Feel.Fire.Flow. - Welcome October with Fall Transitions, Sage Smudging &, Of Course, Food! Welcome October with Fall Transitions, Sage Smudging &, Of Course, Food! We are just a few days in and October has already made itself known with cooler temperatures and leaves beginning to change to the colors of the season. Be sure to take in the beauty of the transition and relish in the mix of greens, oranges, reds and yellows! What transition do you feel happening in yourself right now? The sunny days and fresh air this week make it a great time to open all the windows and fill your home with fresh air. To literally “clear the air” in your home, consider this quick sage smudging practice - an ancient ritual used to cleanse and realign your space and/or self. Smudging is a great thing to do to get rid of lingering negative energy from a pregnancy loss, an unsuccessful IVF attempt, tension in the home, an illness, or major life event. It is symbolic of a fresh start. Back to speaking of colors, let’s talk about everyone’s favorite thing - food! In part four of the local and seasonal foods series, we explore two colorful seasonal foods, delicata squash and, finally, apples. A winter squash, available in the Northeast in September and October (so technically “fall squash!”). 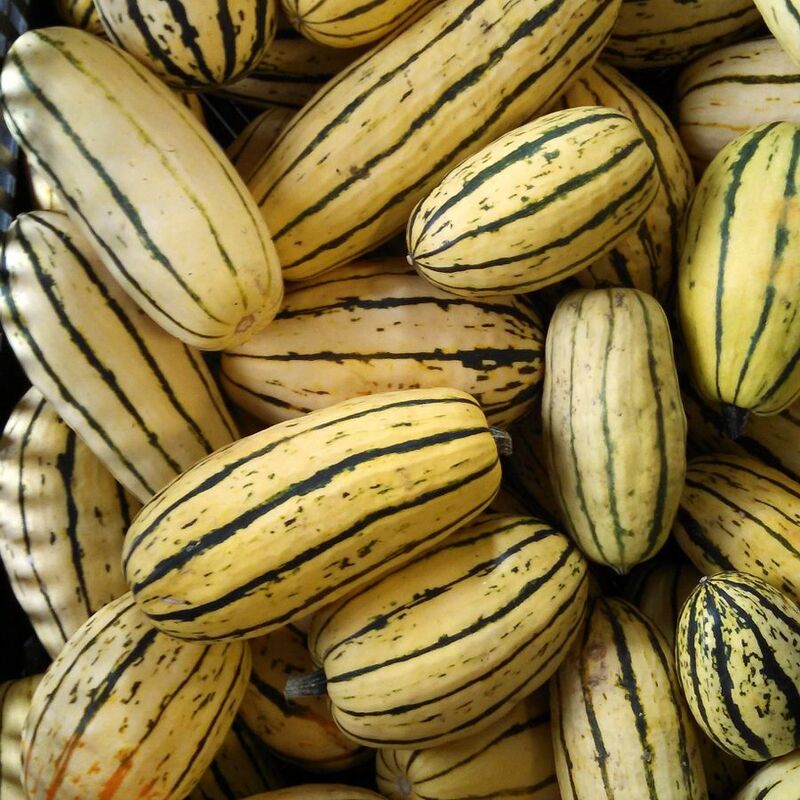 Delicata is that intriguing looking squash that is longer and yellow with green ribs that makes you look twice at the market. It is well worth a try! Sweet in flavor, often compared to that of a sweet potato or sweet corn. High in fiber, low in carbohydrates for blood sugar balance. Abundant in antioxidant vitamin A, which is critical to build up on for fertility. It also helps keep skin and eyes healthy, supports the immune system and neutralizes free radicals. A great source of iron*, which is necessary for cell production and growth, and circulating oxygen throughout the body. This is important for us and even more important for fertility. A solid source of calcium. An immunity booster due to its high vitamin C content. *Note: Women are very commonly iron deficient so you may want to consider talking to your doctor and getting your iron levels checked. For an extra anti-inflammatory boost try this Delicata Squash with Tumeric recipe from Skinny Taste. Try this easy Maple Roasted Delicata Squash & Chickpea Zucchini Pasta vegetarian recipe from Inspiralized. I’m also loving this colorful, sweet and savory recipe with delicata squash and brussel sprouts from Jessica Galvin. Available in the Northeast July through October. Be sure to enjoy organic apples as they sit high at #4 on the Dirty Dozen list! A great source of boron, an often overlooked but incredibly important mineral that supports fertility and hormone regulation and balance, for women in all life stages. It also strengthens brain function and focus, works with calcium to improve bone strength, and assists the body in the formation of Vitamin D.
*Note: If you have frequent bloating and gas, Irritable Bowel Syndrome (IBS), or Small Intestinal Bacterial Overgrowth (SIBO) and/or are following the low FODMAP diet, unfortunately apples are on the list of fruits to avoid. A total fall-fun buzz kill, I know, but well worth it to avoid putting your body under that stress. For an easy make-ahead and take for lunch recipe, try Dr. Axe’s Apple Quinoa and Kale Salad Recipe. Try this dairy free, gluten free, paleo friendly Apple Galette for a crowd pleasing fall dessert from Lexi’s Clean Kitchen. Wicked Spatula’s Slow Cooker Apple Cinnamon Pork Loin is a convenient, vitamin-rich, flavor-packed recipe perfect for a weeknight meal. Did you identify with a transition you feel yourself going through this fall? Share below in the comments section!